Teachers are excited about the coming school year and the welcome addition of the grade nine class. The school will be expanding the offerings of programs and activities over the lunch hour to provide greater opportunities for students to get involved and feel welcomed. Grade nine students will have the benefit of a similar school day structure to their middle years experience by maintaining a ‘homeroom’ feel with fewer teachers, unlike the older grades. Carpenter High School is also one of a select group of schools across Saskatchewan that has implemented the Following Their Voices program. Following Their Voices is an initiative designed to raise the educational achievement and participation of Saskatchewan’s First Nations, Métis and Inuit students. Following Their Voices focuses on enhancing relationships between students and teachers, creating structures and supports for teachers and school administrators to co-construct teaching and learning interactions with students and creating safe, well-managed learning environments. Following Their Voices is based on research that was conducted with First Nations and Métis engaged and non-engaged students, parents/caregivers, teachers and school administrators about what is needed in order to be successful as a First Nations or Métis student in school. The ‘voices’ of these groups of people were profound in terms of the issues they identified. Their words and insights, along with international research, and guidance and advice from Elders and Knowledge Keepers formed the foundation of this initiative. 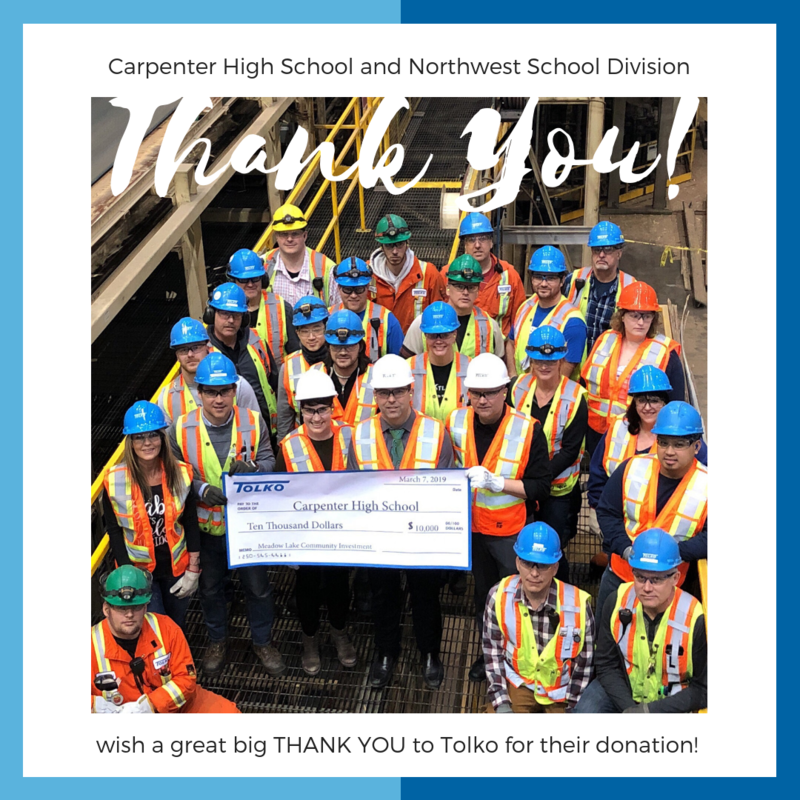 The Following Their Voices program provides benefits for all Carpenter High School students, and the school is excited to expand the program to more classes. One of the core goals is that every student at CHS will know how important they are to the adults in the building. This spring Carpenter will provide multiple opportunities for parents and students to get to know their new school. There will be grade nine and grade ten parent orientation nights. As well, in August grade nine and grade ten students will be able to pre-register before the first day of school. Students will be able to get their lockers, get a tour of the school and meet their teachers. Official dates will be advertised to families once they are finalized. Introducing the new and exciting Gateway Griffin Middle School logo! Gateway Middle School will continue to have the same welcoming, inclusive, positive, energetic and vibrant school environment that the community has come to expect. The school will continue to embody its guiding mission, Take Care of Each Other. In preparation for the influx of older students there have been several building modifications and upgrades to the common spaces, including new school change rooms. Gateway has a tradition of offering activities to engage all students, and that will continue to be the case as they expand to meet the needs of the grade seven and eight students. There will be additional activities and programs and more leadership opportunities for students. Gateway students and families will have an opportunity to meet the staff and tour the facility later this spring at a Welcome Event. Introducing Jonas Samson Middle School! Staff are excited for the energy that grade five and six students will bring to Jonas Samson. In preparation for next school year a new playground will be installed this spring. The school will be looking for volunteers to help with the assembly and installation. Jonas Samson will continue to offer a wide range of extra-curricular opportunities for students, including for the younger students. The goal being that kids get to try everything they want and be a part of any activity. Jonas Samson is planning student and parent information events this spring, with opportunities for students to come in during the day, tour the school and check out the facility, and information nights for parents. Jonas Samson and Gateway already have plans in place to help make the transition for students as seamless as possible. Both schools will follow the same cell phone policies, and operate as closed campuses, meaning students will be required to stay for lunch. Every opportunity will be used to bring the students together for shared activities, including school dances, year-end field trips, grade eight camping trip, track and field day, table tennis, curling, and more. Please check out our previous note home for more information about the school handbook and activities that Jonas and Gateway will share.